Chelsea striker Gonzalo Higuain has vowed to get back to his goalscoring best, hailing the influence of Maurizio Sarri after making his loan move to Stamford Bridge. Sarri’s men have an option to buy Higuain for €36million (£31.3m) or extend the loan for another season in the summer, though will have to pay an €18m (£15.6m) fee to secure the 31-year-old’s services for an extra 12 months. Higuain scored eight goals in 22 games for Milan this season but was at his best working under Sarri at Napoli in 2015-16. The ex-Real Madrid star equalled the Serie A record for most goals in a season with 36 during that campaign and cited the importance of Sarri’s guidance in Naples before he evebtually went on join Juve for £75m. The pair are now reunited in west London, however, and Sarri hopes Higuain can become the lethal central striker that Chelsea have been lacking since Diego Costa’s departure. And Higuain insists his relationship with Sarri, who understands the “emotional side” of his game, gives him confidence he can hit the ground running in English football. 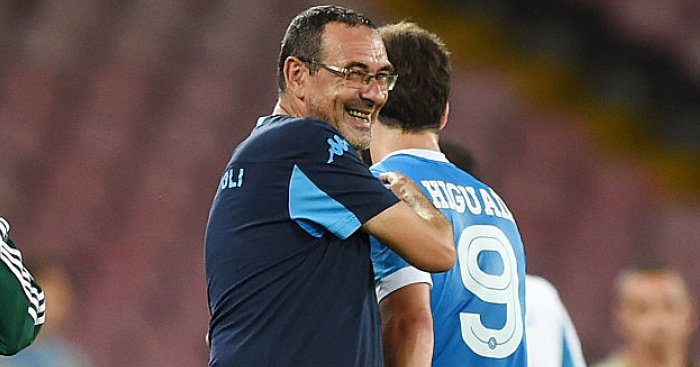 “Maurizio Sarri is the coach who, in my career, has got the best out of me as a player,” Higuain told Chelsea’s official website after signing. “He’s someone who knew how to work with me, particularly on the emotional side. “That year together was fantastic and in big parts thanks to him, so coming to work with him is very important for me. “I’m really happy to have been given the opportunity to do that and I want to get back to that level. “It was a wonderful season and one in which I broke the goalscoring record, which is very important out there. “It was a fantastic year for myself and Maurizio, and a period which we shared together, even though it was a short time. “Now I’m just happy to be working with him again at a big club like Chelsea which has all the history and wonderful team-mates. The post Higuain makes Chelsea vow as full details emerge over cost of loan move appeared first on teamtalk.com.